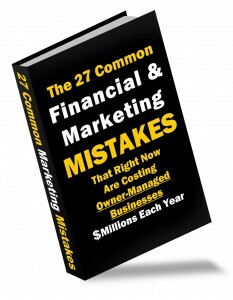 Business owners are making these 27 financial and marketing mistakes day in, day out. The likelihood is that you’re making a number of them too. Simple, easy-to-apply and ready-to-go corrections to these financial, tax and marketing mistakes could save or make you hundreds, EVEN thousands of dollars. Delivered to you over 5 days, each part is pure gold to any business owner who is looking to build a better business. Better still, it’s FREE (for now anyway).